Pitch: Pan and Melon are the best of friends. With work and school keeping them busy, it’s good to set aside time for relaxing together. Help them prepare for a chill day of hanging-out at Pan’s new apartment: explore their quirky homes, collect ingredients for Ultimate Snacks, and find some cute treasures along the way! “Couch Multiplayer” encouraged with controller handoff! Rock-paper-scissors to see who plays as Pan and who plays as Melon, perhaps. Don’t have a buddy? Just play as both! A bit late since I had work in the evening, but I thought I’d post progress from yesterday. Managing to stay on-track so far! Tomorrow will involve some implementation research for MV, since I would like to include some special animations (like picking up key items) in the game. Another point of research there will be how to choose which Pan you play as. Hopefully it won't be too tricky to figure out (Google and YouTube tutorials have been extremely helpful in the past), but I'd rather give myself more time to muddle through that process in case it ends up being more difficult than anticipated. Wow, they ended up realy nice. Plugging away and taking steps. Got immediate character selection for Pan to function in-game without any hiccups via this plugin. It was a little harder to find a solution to custom animations outside of combat (I was likely overthinking exactly how you'd achieve that), since most tutorials cover the combat animations. For anyone curious, you take the same principles of the attack animations in terms of frames/cells. This video was a helpful resource for understanding the parameters and generally how you break up the frames, layer them to create the animation, etc. It also explains it much better and more concisely than I could. 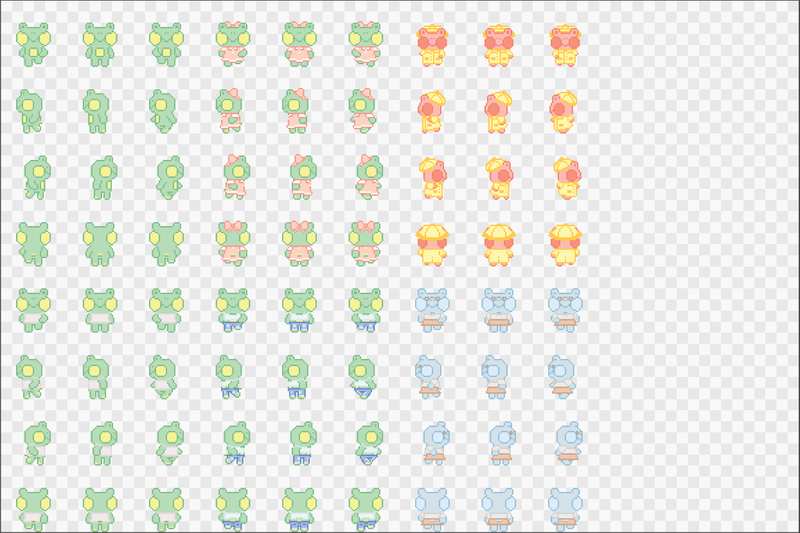 Once you import your animation sheet and get everything flowing smoothly (and scaled down by 50% to keep the sprites a consistent size), you create a new event. There's a "Show Animation" option under the second page of event commands, and from there you simply choose the animation you created and make sure it affects the "Player". I'll be using this technique on Pan and Melon when they collect key items like snack ingredients, and for "snack crafting" (...cooking) animations such as the one below. This is looking to be adorable! I get a real 'sylvanian families' vibe from Pan and Melon. Congrats on figuring out out-of-combat animations-- ive not used MV before but understanding overworld animations was a hassle in VX Ace. Im excited to see what you make!! Thank you so much! I’ve never owned any sylvanian families personally but I see where you’re coming from! My games tend to feel like dollhouses in practice—cute characters and simple objectives. I hadn’t worked with VX Ace extensively enough before switching over to MV, but they did improve on certain aspects of the program that I had been struggling with. Thanks much~ And yeah, I suppose Pan’s sheet looks kind of intimidating, heh. Small world, for sure! That’s one heck of a coincidence! Oh gosh, everything about this is adorable! I was probably a little too ambitious with my daily goals for today. While I didn't make much headway with the Key Items or furniture, I did manage to finish the walls and floors. Broke away from my laptop screen for a bit to make the title illustration, as well, which I'm rather fond of. Hopefully I'll get to catch up with all the little doo-dads that need attention in the next couple days! Furniture tiles are coming along, though veeeery slowly. Got a bit hung-up on what each space needed and kept drawing blanks. 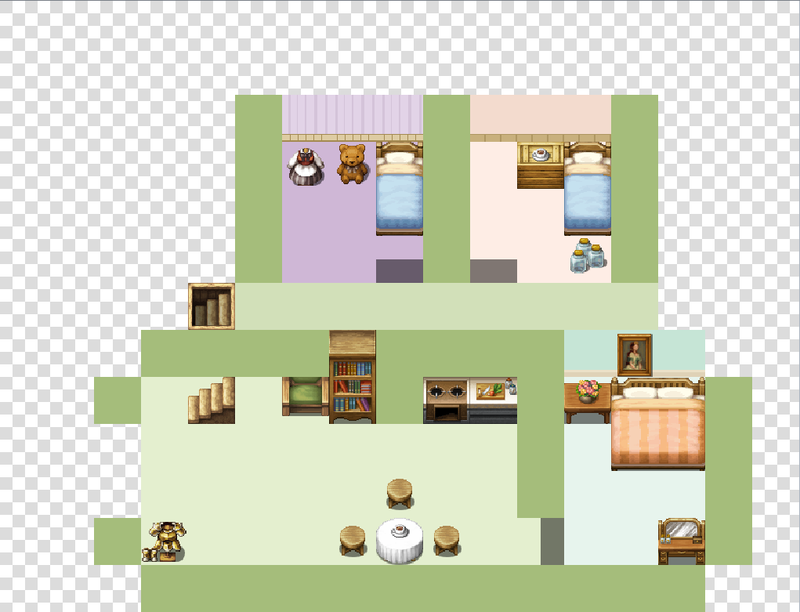 Decided to map out the final 1:1 layout of Pan's Apartment anyway with some placeholder tiles, which definitely gave me some more direction for my next foray into the furniture sets. Melon's House now has a floorplan sketch like Pan's place did. 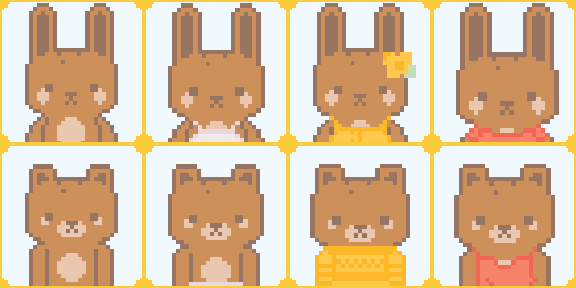 I think my next steps will involve switching into BGM/SFX mode and working on illustrated bits while I'm away from my laptop to avoid burning out on all the sprites/tiles. This is super cute. I love it! No progress to report on, I'm afraid. Between taking care of daily life and attempting to work through a creative block, I don't have anything to show for today. 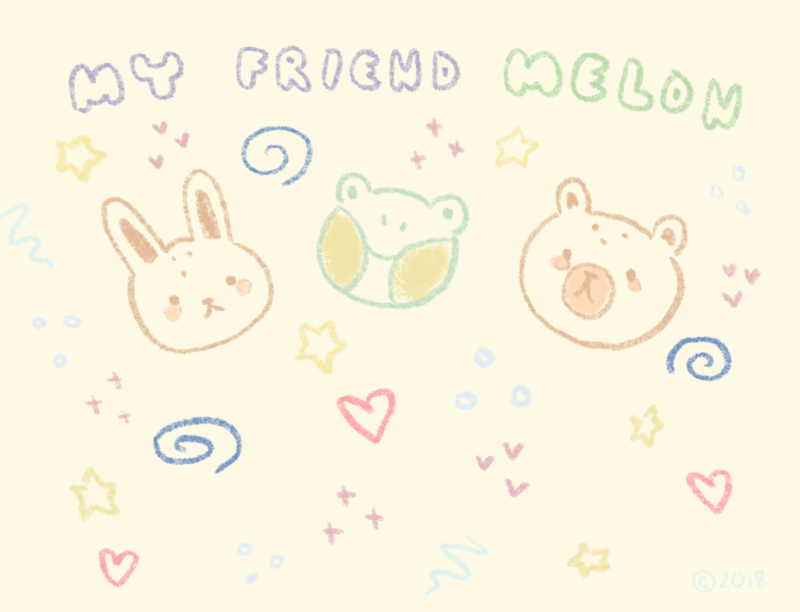 Even trying to produce art unrelated to "My Friend Melon" (sketches, doodles...anything really) was a frustrating time. At least I anticipated the need for a catch-up day far enough in advance that I won't fall further behind on my current schedule. 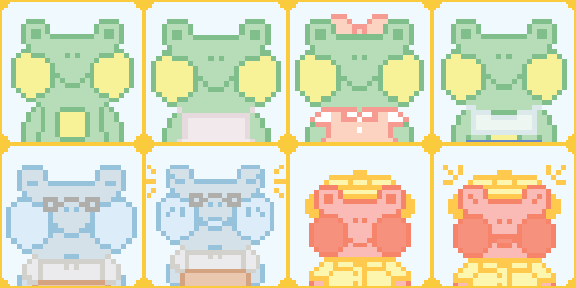 aaaa these sprites are soooo cute and your game premise is really charming! i'm excited to see how this game plays! This looks and sounds plain adorable! I hope you'll get out of your block soon. Good luck and take care of yourself. Everything about your game is incredibly charming. Please keep up the good work! Before I say anything else, I want to thank everyone—the hosts, commenters, awesome devs and everyone in between—for a great jam! It’s been fun connecting with all of you through our mutual love of video games, and I can’t wait to try out the submissions! “My Friend Melon” is still in a very skeletal phase (not much to play around with in its current state), so it won’t be joining the submission pool. Development on the game WILL continue post-jam! You can count on that! Pan and Melon’s little world is one I’d like to share, so if you’re keen on staying informed, I’ll be sure to post updates to my Twitter (@Little_Egg_Tart). I’m considering creating a MFM-specific Twitter account, so that announcement will happen here and/or via tweet. I had a bunch of other things I wanted to say in terms of reflection and personal hurdles, but I’ll save them for another time. Until then, congrats to those of you who submitted, and to everyone who had some fun participating!